JOIN US FOR “HOLIDAY BREAK AT THE MOVIES 2” on the Big Screen on Friday, December 28th at 1PM. 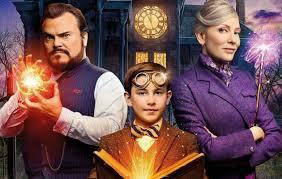 A young orphan named Lewis Barnavelt aids his magical uncle in locating a clock with the power to bring about the end of the world. This movie is Rated PG for thematic elements including sorcery, some action, scary images, rude humor and language. . It is 1hr, 45 min long. This program is open to all ages. Parents, please accompany children under 12. Popcorn will be served. No registration required. For more information, call the library.